The Multiple Directions PowerPoint Template is a creative roadmap presentation. 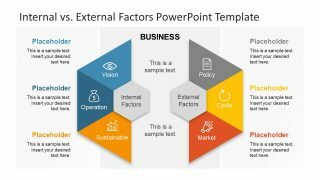 It is a multiple-choice PowerPoint roadmap template. The industry-wide business professionals can use this generic design. 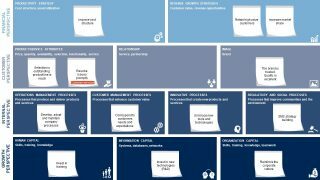 The roadmap illustration depicts various aspects of a topic through multiple directions. The slides display a factual geographical map. 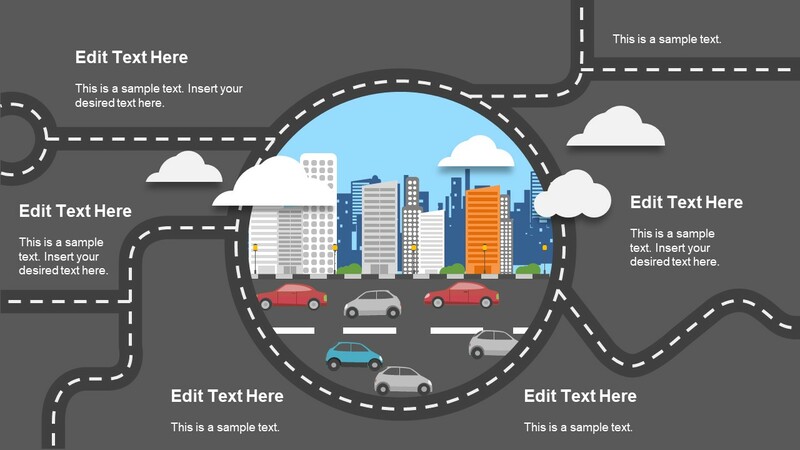 Because the center of the slide contains clipart icons of cars on the road and buildings in the back. It is a visual illustration of business and the city. The multiple directions are a business concept to explain more than one possible outcomes of a decision. Similarly, it can present multiple risk factors. 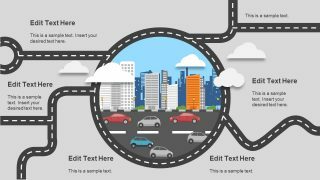 Therefore, it is an ideal roadmap PowerPoint template for brainstorming sessions. This way, the presenter can demonstrate a number of possibilities to the audience. On the other hand, an audience can give their input which may affect the stakeholders of a company. The 2-slide Multiple Direction PowerPoint Template is an attractive slide layout. 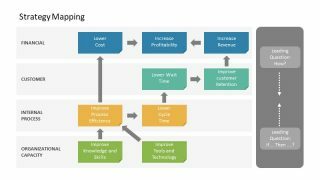 It can help demonstrate the summarized version of complete strategy plan in few steps. For example, show the most probable risk in the middle and mention its mitigation strategies in given placeholders. Such as avoidance, acceptance, reduction, and transference. Now, brainstorm on the likable outcome of each action using the roadmap as a manager’s guide. The roadmap template contains one and a two-way path to show multiple directions. However, it provides another interesting path with round-about to explain recurring actions. 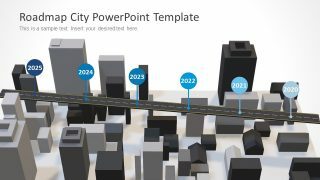 The editable PowerPoint template with multiple direction roadmap has dark and light color theme. It assists the users to pick a relevant slide according to the main presentation. Although, the PowerPoint automatically changes the color based on the main theme. The users can paste a template by keeping the source formatting. The multiple direction PowerPoint contains fully customizable clip art icons and shapes. The users can change the size and colors of cloud icons with shadow effect and cars. Moreover, they can replace the text placeholders and change font styles.